Valentine’s Day Truffles will make your beloved one feel special. These are easy, rich and decadent chocolate truffles. A cheap yet elegant gift! Valentine’s Day Truffles are the best special treat for chocolate lover lovers. There is no doubt your beloved one will feel so flattered when you make these super easy chocolate truffles. You love such simple, easy yet impressive gifts, don’t you? You don’t need a special day to spoil yourself a bit, right? Just make these Valentine’s Day truffles and you won’t be able to stop snacking on them. So it’s better to eat as many as you want before Valentine’s Day comes. Otherwise, you might want to eat them all even before you place them into a fancy looking gift box. Making Valentine’s Day Truffles might sound the easiest thing, but believe me it is much better than most of the pricy gifts because you give your time and effort and your love for sure. 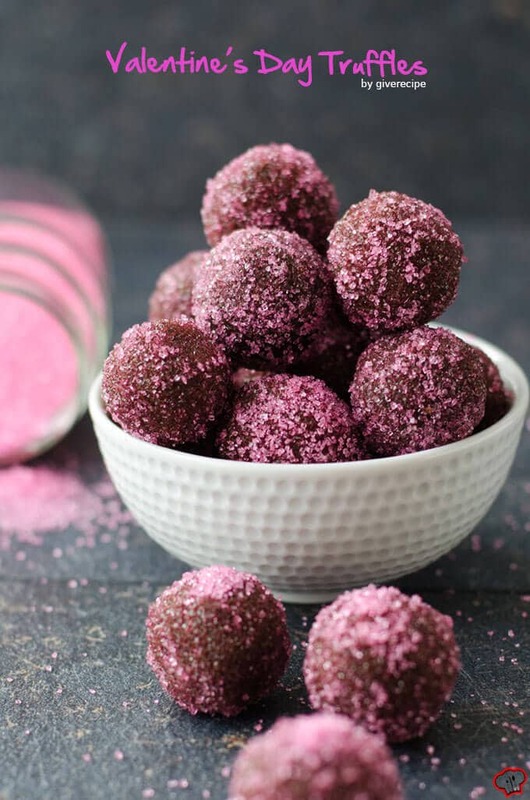 You can surprise your sweetie with these pinkish rich and decadent Valentine’s Day Truffles loaded with dark chocolate even if you have never tried to cook something before. Then it will be a real surprise. No gift with chocolate can go wrong, right? If you have enough time though and feel like baking, you might want to check out our Romantic Red Velvet Cupcakes or Eggless Chocolate Coffee Cupcakes, which are our reader’s all time favorites for Valentine’s Day. I’d love to thank my friend Özge for the recipe. I tasted these chocolate truffles at her home for the first time and just fell in love! I was surprised with the simplicity when she told me how to make them. She coated hers with shredded coconut which was wonderful and she suggested that using other kind of nuts for coating would be fine too. 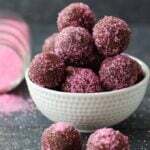 To make these truffles special for the Valentine’s Day, I coated them with pink sprinkles and there became a very sweet color when pink and dark brown combined. Oh boy ! Great photos! Although I’m a bit late, it does not stop me from making these beauties for any other special occasion right ? Thank you so much for sharing ! 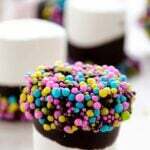 These look gorgeous with the pink sprinkles. And so easy, which suits me perfectly. I can’t wait to make them, not for valentines but just because I can! These are gorgeous! And with only 4 ingredients?! I’ll be making these for my hunny for sure! Thanks for sharing! 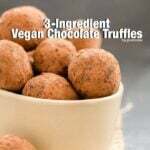 I just love how easy these truffles are to make and how little ingredients they require. They look super impressive and delicious! These truffles are so pretty! I love the pink coarse sugar. It gives the truffle a little sparkle, perfect for Valentine’s day!